AFTER SHOT. Today's post is non-stamping related and deals with organization. I'm an organizational freak, and thankfully married to one too. 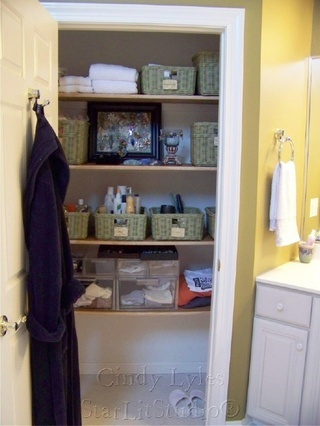 I recently re-organized my linen closet in my bathroom, and wanted to share what I did to make life easier. The closet is an unusual shape. 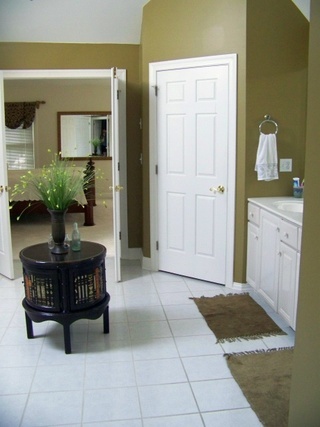 There are two of them - one flanks each side of the vanity in the master bathroom. So funky are the closet shapes that the two national closet companies that came out to quote another project kindly declined to tackle them. BEFORE. So I was left with four shelves. And a mess. This is the before shot. Imagine knocking over one bottle of lotion - it was a domino effect!! aaaagh!! My towels needed to be higher to be avoid getting bumped. Neatly stacked towels are a must in this house - I'll openly admit I have OCD with certain things. The clear storage bins with blue lids on the top shelf worked for a while, but most of those items didn't fit into one clear bin - I needed baskets - one per function. I found these purtty celery ones at Pottery Barn Kids a few months ago. I can't find this color online now so you want this color you might try calling stores in your area. 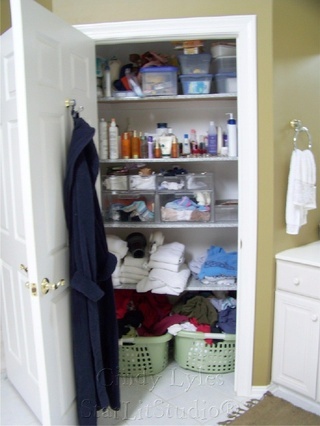 I moved the dirty laundry at the bottom into a huge wicker hamper in our master bedroom closet - which is off of the bathroom versus bedroom - my preference for speed when getting ready. Then I created soldered labels using 7gypsies paper (Saratoga) as the background. I printed the trimmed 12x12 patterned paper down to 8.5x11 sheets and ran through my printer, incorporating a vintage font called Grunge Caltek. May Arts ribbon ties the soldered glass labels to each basket. 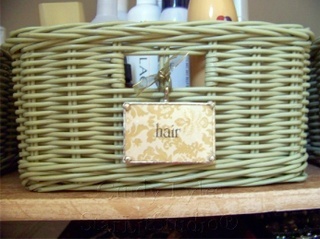 Most of the baskets have a custom cut piece of 1/2" plywood in the base so bottled items stand upright easily. Underpinnings are stored in clear drawers from Hold Everything (now West Elm - but they only carry the smaller size - check ebay or other storage sites for the larger size). 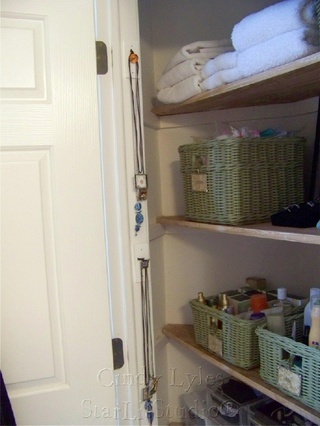 Because I get fully dressed in the bathroom to save time, I have my handmade, everyday jewelry in this linen closet too. 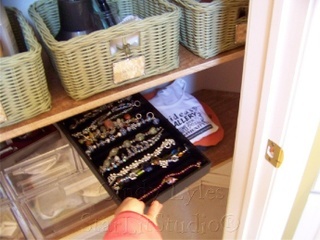 Storage consists of lined jewerly trays and and bracelet trays from firemountaingems.com. 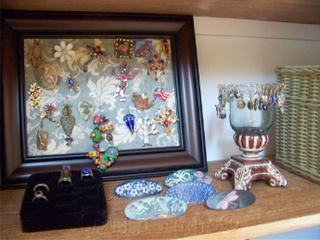 The decorative pins and pendants are hooked directly into, or mounted with pins that are stuck into a Michaels' frame - I removed the glass and inserted a cloth covered corkboard. A layer of cotton batting lays between the fabric and corkboard for extra plushness. The last storage solution idea I had was to use 7gypsies knobs as hangers for my many pendant necklaces. The knobs were mounted onto small pieces of painted plywood (thanks to my wonderful handyman Bob the Builder who built my ribbon armoire and the plywood basket inserts) then mounted onto the interior door frame molding. I'm off to organize my husband's side next!! 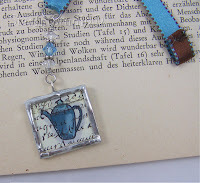 This card and soldered necklace project was a submission to Crafts 'n Things magazine, and appeared in their September, 2008 online newsletter. Instructions can be found here. Hope you enjoy this quick gift idea!! It's Inchie Thursday! Today's tutorial post is featured on the CLASSroom blog, and provides inspiration for monogrammed ornaments. 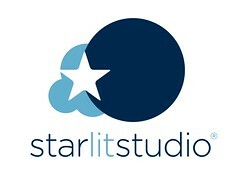 Please stop by for a visit featuring soldering tutorial links. And....Ellen is hosting an amazing give away on her CLASSroom blog today (and tomorrow and Saturday in honor of WCMD - World Card Making Day) ... it's a complete soldering kit!!! OMW!!! 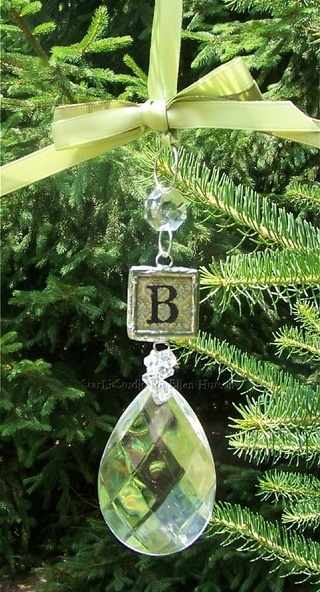 We will have a small batch of vintage chandelier crystal drops in the store in the next day or so. These were discovered at a quaint auction in Bucks County, PA.
For additional Inchie ideas, please visit Lisa Lee's blog all in an inch. Lisa is the owner and developer of the Inchie Arts products that are popular due to their versatility and quality. 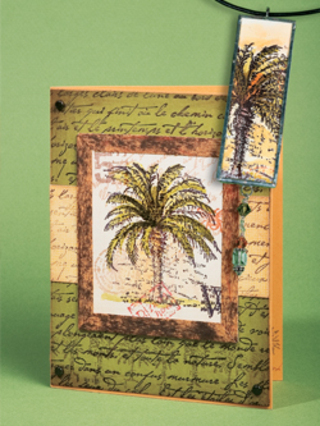 Lisa recently posted on her blog an Alphabet Inchie Accordion book that is a must-see! Good grief it is almost midnight! Before I shut the pc down I wanted to let you all see this bookmark that I created after I saw Ellen Hutson's inchworm bookmark here. I finally got over my fear of cutting glass! It's really easy! Just score with a glass cutter (I wore safety goggles - I'm paranoid...) and snapped it! I am amazed at how easy it is...and I'm going to try it again! If you ever wanted to try soldering, there is a dandy soldering kit in Ellen's store that has everything you will need to get started. Quality tools and materials are enclosed, plus their liquid flux is amazing - better than what I was using...and the heat tool is fabulous! Maintains a nice, consistent temperature, a professional, quality tool...and it's PINK!! The Lockhart teapot was stamped on 7gypsies script paper (Catania) and colored in with Copic markers. After soldering the piece I cleaned it, then attached a few Swarovski crystals and sterling Bali spacer beads (source: Firemountaingems.com). Hey - it's almost FRIDAY!! Yippieeeee~!!! Thank you for stopping by! 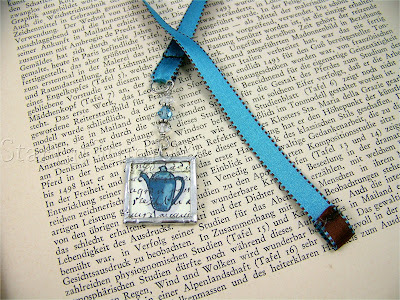 Tomorrow - another bookmark without the soldering, inchie-style!